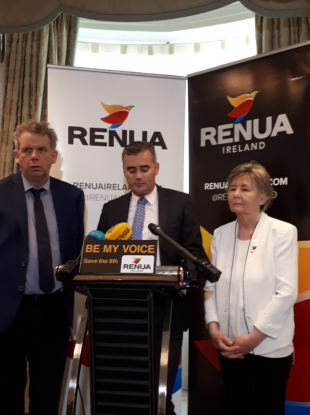 (LtoR) Renua's Michael O’Dowd, John Leahy and Jacqui Gilbourne. RENUA HAS QUESTIONED the number of abortion pills coming into Ireland and has announced a series of policy proposals to “support pregnant women”. At a media event this morning, the party described itself as “Ireland’s only pro-life party” and called for a No vote in next week’s referendum. Renua said its proposals were aimed at cracking down on “deadbeat dads” and supporting single parents in third-level education. The party’s leader John Leahy also said they were seeking “proper facts and figures” about the use of abortion pills in Ireland. The party is proposing a new statutory body to manage child maintenance payments and says this will “remove the need for young mothers” to go to court to enforce the payments. In addition, the party wants additional funding for single parents in third-level education and has proposed free childcare in all third-level education institutions. Renua made these proposals should next week’s referendum be defeated but said they should be implemented regardless of the vote. Leahy said today that the proposals would be costed in Renua’s manifesto when a general election is called. We don’t think any change is required. We believe life is life, it’s one of our core pillars of being a pro-life party and we believe that supports need to be put in place. If you look at this campaign, the amount of money that has been spent, if that was put back into supports for women, that’s what we’re about. Asked about the accessibility of abortion pills, Leahy acknowledged that it is an issue but said they had no specific policy about preventing Irish women taking them. “I would still like to see proof of exactly how many pills are coming into the country, as far as we see it the information that we’re getting is coming from the companies themselves, which is self-promotion. There’s nobody who’s come out with any proper facts or figures on it,” he said. Is it happening? Yes. Have we any policy in regard to how to stop it? No we don’t, I don’t think anyone has a policy about how to stop stuff from being bought online. But we would like to think the measures we put in place to support for women, I think sometimes women feel they don’t have that support. Figures provided to the TheJournal.ie by Ireland’s Health Products Regulatory Authority (HPRA) showed that more than 6,000 abortion pills were seized in Ireland over the past 10 years. Speaking earlier this week, Taoiseach Leo Varadkar said that it was “probably a matter of time” before the 14-year criminal penalty for abortion was enforced if there was a No vote next week. Asked about this penalty, Leahy said that Renua believes the 14-year sentence should be “gotten rid of”. It is an issue, we don’t have the solutions to the issues. The only solutions that we have is that we want to put the supports in place, so women don’t feel they have to go online for such pills. Speaking at the same event, Renua’s Jacqui Gilbourne said that next week’s vote was “not about right and wrong but about killing or not killing”. “I like Albert Camus would rather be wrong and kill no one than right and kill millions,” she said. Gilbourne said that it is “an illusion” to say that it is “better for a baby with a fatal foetal abnormality to be aborted than to be allowed time with its mother “. She claimed that many people “believe in the lie that women are too weak to climb the cross of the moment”. “Women are stronger than that, women are stronger than they think,” she said. Email “Renua calls for No vote and questions the number of abortion pills used in Ireland”. Feedback on “Renua calls for No vote and questions the number of abortion pills used in Ireland”.